The Masvingo City Council has announced a $32m budget whose main focus is to alleviate the perennial water supply shortages in the city and upgrade the poor road network, especially in the high-density areas. According to the budget statement, the city requires $50 million to construct a duplicate water treatment plant under the water augmentation phase two project. 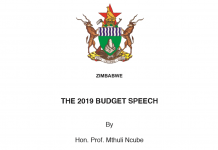 “We have budgeted for $50 million in this current budget and we expect the remaining $50 million to be spread over the next four years,” the budget statement said. The local authority also aims to complete works on the Mucheke Sewer Trunk project, which will improve sewer reticulation as new residential areas have mushroomed all across the city, taking the population to over 120 000 at the moment. The sewer project has been allocated $2,6m in the 2019 budge, which aims to improve educational services in Council’s school, the construction of market stalls at the Garikai Market, the expansion of health facilities at Rujeko Clinic, the servicing of residential stands in the Mucheke D and Rhodene suburbs, and bringing improvements in information technology. But residents are not happy with the rate increase. The Masvingo United Residents and Ratepayers Alliance (MURRA) is planning to mobilise its members to resist the budget. “We will not recognise the budget, we raised our objections on water and refuse collection tariffs withing the stipulated 30-day time frame. We will soon meet and chart the way forward,” MURRA spokesperson, Godfrey Mutimba, said. The water rate has been increased to $1,20 per cubic, and refuse collection to $1,40 per bin for domestic consumers. According to the budget, water and service charges are expected to generate $12,7m in revenue.